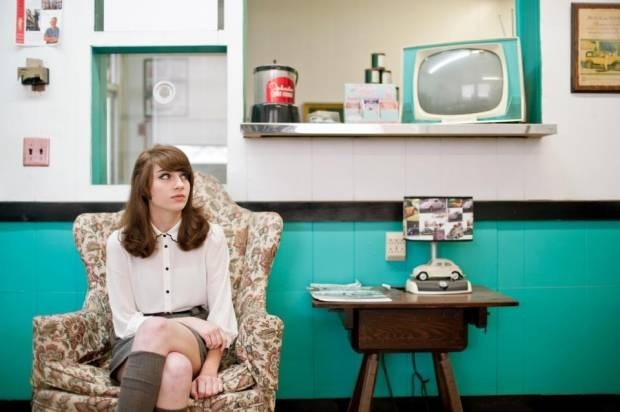 Souvenir Stand is the 60s project of Stephanie Cupo, who premieres the effervescent single, “Wherever You Go” as a cool drink of cane sugar sweetened soda pop shop pop. Having studied classical saxophone in college, the brass instrument lead Stephanie toward an interest in composition and songwriting that harkens back to the days of polyester dress and the popular dominance of the 7″ 45 medium. With hearts stitched to their sleeves; Stephanie's songs, sax and keys are accompanied by percussionist Andrew Pierce, guitarist Vin Landolfi, and bassist Mickey Hudson, who set up a record stand to retain the singles spirit from the 1960s as preservationist society selling forget-me-nots in their own roadside attraction. With surf strummed guitar strings and an understated saxophone center, a bright summer days sun is delivered like a hot cup of diner coffee. “When it was sunny, oh I never went outside, but you were funny and we laughed until we cried, cannot last, for all my days, but we have is here to stay”. With Stephanie's studied approach to the California sound by way of Jersey City; the Cali-classic-dream beams of enchanted ultraviolet sweeteners bring the energy of a fling to cling to for as long as you can. Desires for companionship and friendship are championed in the name of the immediacy and comfort, expressed in lines like, “it's worth much more to feel just once like everything is okay”, that develops from the thrill of the moment toward a desire for something more permanent in the next verse with, “It's worth much more to feel just once that this will never end”. The analogue recorded “Wherever You Go” is constructed like the vintage Polaroid from the State fair that remains in your wallet long past the changing of the seasons. Like Stephanie's anachronistic vision of recreating the sound of an era, Souvenir Shop works in wares and ways of making music that plays on memories while keeping the remembrance of meaningful encounters flickering with heart. In a jangling jingle for the office, for the commute, or for those lonely moments on public transportation; Cupo and friends leave you with a charm locket for safe keeping. “Remember those days, remember those nights, remember those little things, remember the sun was sun was shining bright”, the chorus reminds you with care, even if the sun has already set and a frozen lasagna t.v. dinner is on the menu. With the recreation of sunny studio sounds from half a century back, even the most pessimistic hearts may become thawed like an ice cream scoop that has fallen upon the warm sand. The parting love-note of “you carry a piece of my heart, wherever you go” stays with you whether you're at home, working late in the office, at school, or strolling back home again. Souvenir Stand's EP DAYS will be available April 29 on cassette and digital from the UK imprint, Beautiful Strange.